Folsom carpet cleaning by Carter’s Carpet Restoration is Folsom’s first choice for a local, family-owned carpet cleaning business. They are experts in carpet cleaning, tile & grout cleaning, wood floor cleaning, and even upholstery cleaning. Also, Carter’s has been providing the 95630 and 95763 Folsom areas top-shelf service for nearly two decades. Carter’s guarantees every Folsom carpet cleaning 100%. Additionally, Folsom residents just voted them Style Magazine’s Readers’ Choice. El Dorado County also voted them Mt. Democrat’s Best of the Best! So, call Folsom’s best carpet cleaning choice, because your family and your home are worth the Best of the Best! Carter’s delivers the area’s highest-quality Folsom carpet cleaning, from Granite Bay to El Dorado Hills, all around Folsom Lake, and beyond! Dean and Karen Carter happily take your call and personally schedule your appointment. Call (916) 933-7807 today to find out what Carter’s can do for your home! With Carter’s, you always get green cleaning products. They use only the best cleaning equipment, from oversized cleaning trucks to high-tech air movers. They do the job right, because your satisfaction is their top priority. What’s more, if you’re not satisfied, they’ll re-clean your carpet. Carter’s believes well-educated, well-trained, and dedicated employees are the keys to satisfied customers. First, every Folsom carpet cleaning technician passes a thorough background screening. Next, Carter’s techs set themselves apart through training, experience, and comprehensive examination. Finally, they earn IICRC certification. As a result, they rank at the top of the industries’ most skilled and dedicated technicians. Trust Carter’s to provide your Folsom home the highest quality technicians delivering the very best carpet cleaning. Year after year, residents in Folsom, El Dorado Hills, and El Dorado County vote Carter’s their favorite carpet cleaner. From Style Magazine’s Readers’ Choice Awards to the Folsom Telegraph’s Best of the Best, Carter’s is happy and proud to return to the stage, accepting award after award. As of November 10, 2016, Carter’s had received Style Magazine‘s Readers’ Choice Awards 7 years running. They even earned another Hall of Fame Award this year! Also in 2016, Folsom homeowners voted Carter’s Carpet Restoration the Best Folsom Carpet Cleaner in the Folsom Telegraph and the Village Life! Do you live in beautiful Folsom, CA? Does your carpet need cleaning? Call (916) 933-7807 today! 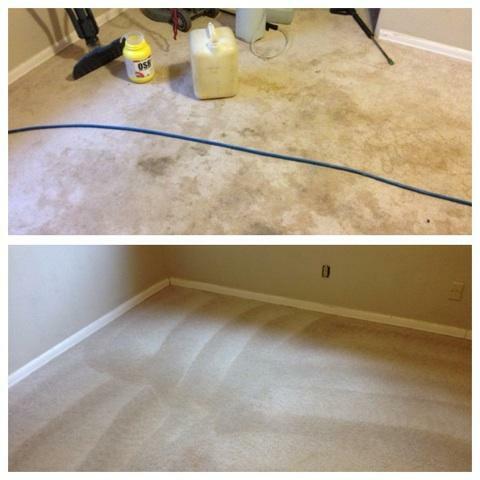 Learn what a difference a Folsom carpet cleaning by Carter’s Carpet Restoration can do for your home. You’ve seen the big trucks around and it’s easy to see why Carter’s is the number one Folsom Carpet Cleaning Service. The best Folsom Carpet Cleaning Service begins with proper equipment and quality cleaning products. With Carter’s Carpet Restoration, it goes even further than that. You get the deepest carpet cleaning, highly trained and certified technicians, and your carpet will be dry to the touch before the guys even leave your home! Obviously, equipment used in the carpet cleaning process plays a huge part in just how clean your carpet will become. The power and heat generated by the huge Carter trucks is significantly stronger than any other cleaning machine out there. The results are cleaner, softer carpet that will be dry to the touch when the technicians leave your home. Quality cleaning products are an important factor in choosing your Folsom Carpet Cleaning Service. As you may know, not all cleaning products are the same. Just think of your laundry . . . you’ve probably tried the cheaper detergent. It just doesn’t get the job done like some of the major brands. 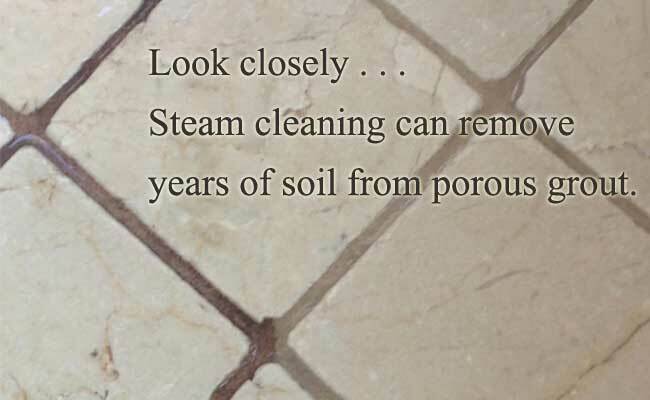 The same is true for carpet cleaning products. If you want the best results, you’ve got to invest in the right cleaning products. The same is true for carpet cleaners. You have to invest in quality employees, and Carter’s does just that. Carter technicians are some of the best in the business. Plus, they are friendly, trustworthy and kind. All of the guys have been background screened and you’ll likely enjoy having them in your home. Carter’s certainly won’t be the cheapest Folsom Carpet Cleaning Service out there. If you’re looking for the $99 special, keep looking, but if you’re looking for quality the you’ve come to the right place. Call today, 916-933-7807. You’ll be glad you did! 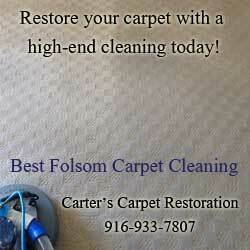 The best Folsom carpet cleaning and carpet repair is what you can expect from Carter’s Carpet Restoration. 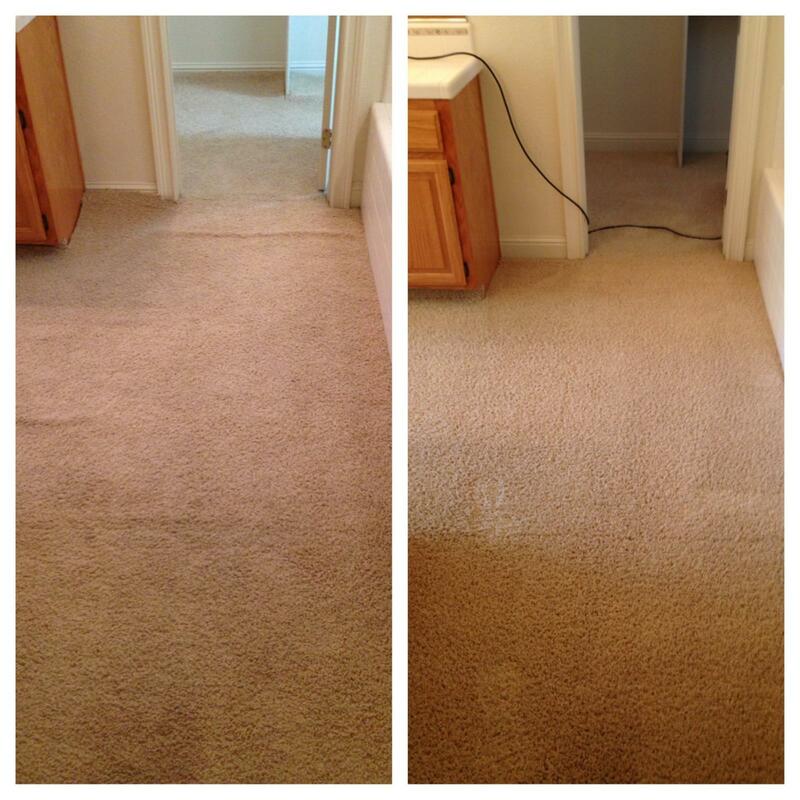 Before and after photos of a Folsom Carpet Cleaning by Carter’s Carpet Restoration. The above photo shows just how clean Carter’s can get a heavily soiled carpet. 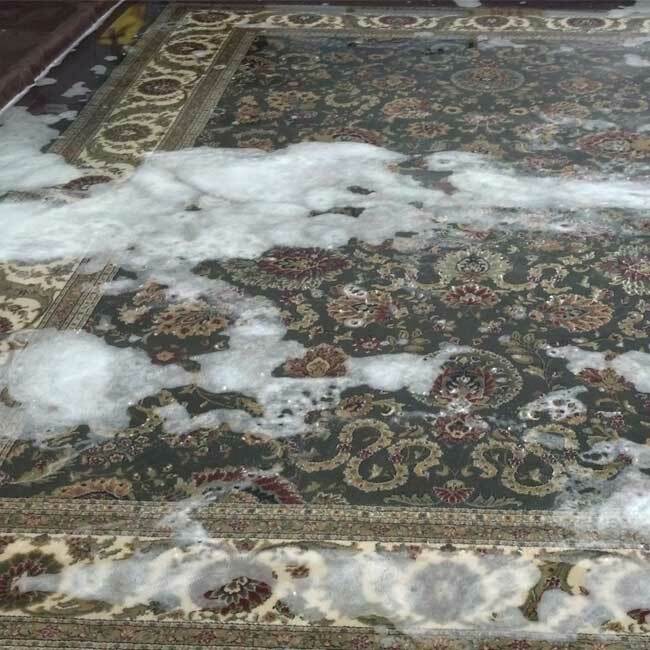 Your carpet is probably in better condition than the carpet in the photos, however extreme images like this show you just how powerful a carpet cleaning you get with Carter’s. You get the most powerful carpet cleaning equipment made starting with true truck mounted equipment, rotary extractors especially made for carpet cleaning, top of the line carpet cleaning products, and high-speed air movers used to dry your floors after a carpet cleaning. The combination of this unique equipment gives you the deepest and best Folsom carpet cleaning available. Did you know that Carter’s also offers carpet repairs? You can have your carpet re-stretched or even have burn marks replaced with a patch. Folsom carpet repair showing a carpet re-stretch. Over time your carpet can relax and get unsightly wrinkles. These wrinkles are bothersome to look at, and can even be dangerous because they make your walking surface uneven and a possible hazard for trips or falls. Carter’s Carpet Restoration has skilled technicians who are trained in carpet repairs and carpet re-stretching. Call the office today to schedule a free in-home estimate to see what Carter’s can to for you.